College!!! UCLA!!! The Grateful Dead!!! Pauley Pavilion!!! We were fantasizing a “Good Morning Little Schoolgirl” opener, but that would have been way too easy, and besides--Pigpen was already gone. And, like anything great, particularly the Grateful Dead, it’s the hard parts that make it all so special. It’s difficult to imagine anything in life better than the Grateful Dead coming to your house. Thirty-nine years ago; 11-17-73; there we stood. And prayed. Saturday night. We didn’t have to go far. We had just finished practice the day before. We didn’t practice on weekends--we needed our rest; and time to see the Dead. Our first game of our senior season at UCLA was still a couple of weeks away. We hadn’t lost a game since we started there more than three years before. Everybody was going except, sadly, Coach Wooden, who consistently sent back all of our invitations. He never did go--truly one of the great failures of my life. Although he did always offer us tickets to join him for the upcoming Lawrence Welk tour. I never took him up on it. We weren’t worried about getting in. We were already in. Practicing the game we love, in the gym we love, under the tutelage of the Coach that we love, while the band we love is setting up in the background. On Saturday night, the little schoolgirls of their way in, lovelights shining. Beaming. This wasn’t my or our first time--at anything. I had been going to Grateful Dead shows for the better part of five or six years, since midway through high school, down the road and beach in my hometown of San Diego. Live rock concerts have been a staple in my life since I was about 15. On my first day at UCLA in the fall of 1970, Neil Young played at Royce Hall. OH, MY!!!! Throughout the fours years I was at UCLA, we saw everybody. Los Angeles presented endless and dizzying possibilities on all fronts. From the clubs on Sunset, to the Forum in Inglewood, the Shrine and Sports Arena downtown, the Santa Monica Civic, the Long Beach Arena, to the dance halls of San Bernardino, we were out there as often as we could. Like most college students, we spent the vast majority of our time in the library and church. We loved our teachers, librarians and ministers: Bob Dylan, John Lennon, Jerry Garcia, Bob Weir, Neil Young, Crosby, Stills & Nash, Carlos Santana, John Fogerty, Creedence, Micke Jagger and The Rolling Stones, Jackson Brown, Jorma Kaukonen and Jack Casady, Stevie Wonder, Joan Baez, Eric Clapton, Ringo, George and Paul, The Who, Stevie Winwood, Traffic, James Taylor, Elton John, Joe Crocker, Dave Mason--it was an endless list. They were all quite regular; and we lacked for nothing--ever. The Dead had already played Pauley Pavilion two years earlier, when w were just getting going there. That was another good night. So we were more than ready when the Dead came back in November ’73, though Mickey was not playing in the band at the time. And Keith had just recently sat down at the keyboards. We always played our best when the games surrounded the concerts--or was it the other way around? We could never figure it out; admittedly we didn’t try very hard on this one. Upside out, inside down, never a false alarm. Pauley Pavilion, much like the Grateful Dead, opened in 1965. The first basketball game ever played there was Kareem’s first public offering for UCLA, when his freshman team trounced the varsity--the two-time defending NCAA Champs. My first time there was in 1969 for Kareem’s last home game as a Bruin when he led a complete rout of Santa Clara on their way to his third straight NCAA Championship. Kareem lost only only time in Pauley. It was all quite the recruiting tool for a 16-year-old schoolboy, even though I was always Wooden’s easier recruit. I am guilty though of eventually becoming Wooden’s worst nightmare and of taking years off his life--driving the poor guy to an early grave at 99. Pauley is a great venue--for anything. And they have certainly tried most things there. Why not--it’s college. Let’s go!!! One of the finest features of that majestic palace is the sheer size of the open floor--and did we ever take advantage of it all. Coach Wooden was masterful at utilizing every available inch of space--his game being all about skill, timing, and position--just like the Dead. But the Grateful Dead might have even been better at it all--waving that flag of ultimate freedom wide and high. The gigantic floor space, big enough to have three full courts side by side, was simply perfect for an indoor Dead show, everything unfurling under all the championship banners already hanging like postcards from the rafters: 1964, ’65, ’67, ’68, ’69, ’70, ’71, ’72, ’73. Legendary teams, talents, coaches, games, and now the Grateful Dead back for more. Might as well. Some have complained mightily over the years about sound quality in the big barns, maybe most articulately our friend Frank Zappa, who quipped, “When you play music in a place designed for basketball, you take your chances.” Clearly Frank was not in touch with John and Helen Meyer, nor Bear for that matter. One of the endless strengths of the Grateful Dead is to make the music sound GREAT--anywhere, anytime, anyplace. Taking the chance and chasing the dream is always the best part of life, never more so than with and in the Grateful Dead--it’s what we’re about, it’s who we are. I got on the bus 45 years ago, and I’ve been smiling ever since--even on the cloudy days. In late 1973 the Dead were in the ongoing, painstaking process of erecting the Wall of Sound. It was “coming soon”--officially four more months. They weren’t quite there with it this night at Pauley, but with the eternal and evolving construction well underway, we couldn’t have been happier. The peace, serenity, and safety that we always associate with the Grateful Dead never exists in a vacuum. The job is to create it, no matter the craziness and darkness that always lives in some men’s heart and eyes. The year 1973 was a particularly hard and high time, what with the madness and evil f the Nixon cabal, the black-throated wind of Reagan sucking the life out of the California Dream, and the ongoing deceit and lawlessness of the Vietnam War and Watergate posing crimes against humanity, civility, and decency. In a remarkable harmonic convergence of the highest order, on the very same day that the Dead were playing this incredible concert at Pauley, November 17, 1973, Nixon was in Orlando, Florida, delivering his “I am not a crook” speech. We didn’t believe or trust that declaration either. But the heavy-handed mayor of L.A. for years, Sam Yorty, was finally out and was replaced that summer of ’73 by the conscientious pragmatist, Tom Bradley, also a UCLA man. J. Edgar Hoover had thankfully died the year before (death sometimes does have mercy on us all), and Nixon was spiraling ever so far downward toward oblivion. So fortunately the winds of positive change were starting to blow stronger and more consistently as the guys were beginning to work. “U.S. Blues” up and into the rotation--finally breaking down all the doors with the “U.S. Blues” a little more than three months after this epic night at UCLA when the Dead first threw the gauntlet down at Winterland in late February 1974. It was clearly a tipping point, finally ushering Nixon out the door. And so it was, the Dead coming to Pauley Pavilion for the second of six eventual shows there: 1971, ’73, ’78, ’79, ’80, ’82. Like our basketball team’s championship banners. Jerry even played a couple of shows there on his own in early 1993 with his Garcia Band. I was lucky enough to go to them all. The first Grateful Dead show in Pauley, in ’72, we were sophomores--same deal; November; just before the start of the season. The New Riders opened that night. It was epic in many ways, including the duration and speed. Coach Wooden had to be impressed with everybody’s fitness and stamina, although Coach was always tight lipped with any praise. The ’78 show was part of a big California run-up to New Year’s Eve in San Francisco and featured a huge tribute to the band’s Egyptian field trip earlier that fall, including a magnificent slide and light show, plus a stirring exhibition of native African drumming. 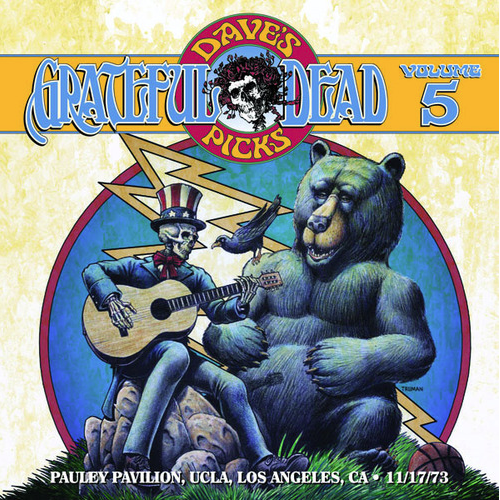 The ’73 show, now memorialized in this Dave’s Pick Volume 5 (with fabulous over art by Tim Truman, the same brilliant artistic creator of the Grateful Dead Hall of Honor tribute--my highest honor) is a three-CD package of life, love, and hope, including over three hours of glorious music and a set and song list to dream about. I was not to meet the Dead as people and friends for another nine months--just way too shy, to this very day--but I was a proud and devoted fan to the core already. A wonderful aspect of life with the Grateful Dead was how the songs--heck, even whole concerts and tours--seemed to be written, performed, and sung for and to YOU. How did they know? They’re like the thermos. It didn’t matter; they got the job done. And 11-17-73 was no exception. The band hadn’t played since Wednesday night in San Diego. Imagine the charity work they were able to perform in Southern California during the two days off in between. When the band finally took the stage that night on the west end of our home court, using our locker room as their sanctuary--the same way we did--we were ready. Hanging in the back of the crowd of smoke jumpers--the ones who came over the rails of the upper deck to get to the floor, like the fog rolling in over Point Dume or the Santa Monica Pier, or so reminiscent of UCLA’s Inverted Fountain spilling downward toward the center--we were easily able to follow the rivulets of humanity all the way to the front of the stage, like trailers on the fast break. We knew the seams and flow on that court better than anyone. And when they opened with “Me and My Uncle,” we were already on fire; in the zone and hot as can be, just like our heroes. The travelin’-on anthem had everybody rocking from the first backbeat, and the ladies were bouncing early on. Big, broad smiles all around. We never looked back or around. And still haven’t--to this very day. Except that now they’ve asked me to flash back to what it was like and all about. It was like everything else during those fantastic days at UCLA--better than perfect. Flashing back to the set list--we’re always grateful that somebody remembered to write it all down--it’s eerie how prescient they were in putting it all together. Taking us from the ever-present sunshine, teasing us with the never-realized threat of rain, through the cautionary tales of woe, to the beginning of the race for glory, through the sunflower gardens and cool Colorado rain (where they were headed next after L.A.), down the big river of life that was UCLA, wrapped lovingly in the warm and tender gaze of the brown eyes, before pulling it all together in a giant round of reelin’ and rockin’, before finaly giving us a nanosecond to catch up and get our breath, and maybe a sip of water. And we thought Coach Wooden’s practices were up-tempo. OH, MY!!!!!!! Started it right back up here though, in the boat and at the oars, reminding up all of the hard work yet to come, sharing all the while, on a team, with a great leader, coming together as a squad, realizing the true meaning of it all, the songs becoming accordions, with the angels singing through the guitars, heading back out on the road, eyes now wide open, living, experiencing, and witnessing perfection. Then finally sending us out into the night driving the endless and ever-faster train that eventually took me to Boston 12 years later. Where, like this newest release, I was #5. Like coach Wooden and Larry Bird, they always did. And now you can too. Jump right in, folks. It’s all here. The time-traveling spaceship is about to take off. Space is limited--only by your own hesitation and reluctance. UCLA, basketball, and the Grateful Dead--it all rolls into one. Teamwork, creativity, imagination, electricity, fundamentals, physical fitness, speed and quickness, the fast-break, dexterity, flexibility, footwork, crazy fingers, communication, discipline, the beat, rhythm and pace, offense, sacrifice, structured freelance, soaring through time and space, a dream, vision, and a plan. Never had such a good time. It was great. I was there. I still am. Although I haven’t been in Pauley Pavilion since Coach Wooden’s memorial service there in June 2010. Hold on, here we go!!!! Enjoy the ride. Roll on forever. Monday’s practice was the best we had all year--by far. This album was released in February 2013.